A Pennsylvanian coin and memorabilia dealer is selling a trial pattern of the proposed US trillion dollar coin, it announced last week. American Mint has created a copper coin layered with platinum to represent what the $1-trillion piece would look like if the US Congress were to approve it. The front of the coin features an American bald eagle with a symbol of "Liberty" on the reverse. The model retails on its website for $9.95. Financial bloggers in the US floated the notion of a trillion dollar coin to address the nation's debt problems. 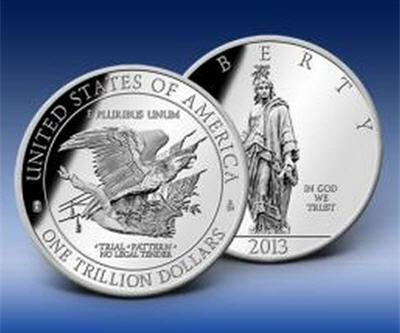 A technicality in US law says its Treasury has special discretion to create platinum coins of any denomination. The US Secretary of the Treasury could then deposit the coin in its bank account via the Federal Reserve. Afterwards, it could sell bonds to raise money to pay down the debt.